Chat with a librarian 24/7 on our live chat site. We generally respond to questions within 48 hours when the Library is open. Call us during Library hours, 718-960-8580. Stop by the Reference Desk on the first floor and talk with a Librarian during Library hours. Contact a subject specialist librarian to help you with in-depth research questions. Your Lehman360 username is your first name.last name and password is the same as your Lehman email password. To login, enter your barcode without spaces or dashes. Your barcode must be activated in the CUNY library system. To activate your barcode, visit the Library’s Circulation Desk. If you need assistance, contact the Print Help Desk in the Reference area - or the IT Help Desk, help.desk@lehman.cuny.edu, or 718-960-1111. For further assistance, contact the Library IT Help Desk in the Computer Lab on the Concourse level, help.desk@lehman.cuny.edu, or 718-960-1111. Short videos on how to do everything from renewing a book to choosing a database. Also learn about printing in the Library and how to contact a librarian in your major field. Art students at Lehman team up annually with Library faculty to create Web Comic about life as a Lehman student. And you'll learn something about research as well. An assignment in Francisco’s graphic design class sends him on a journey through the historical art movement known as Art Nouveau. Along the way, he discovers strategies for formulating a research question that arises from his own interests and curiosity. Liz discovers her mother has diabetes. She and her friends set out to learn more about the disease. Marisol Alvarez learns some hard lessons about academic integrity at Lehman College. Need help with your citation? Our Citation Research Guide will help you. Click Register to create a NYTimes.com account using your cuny.edu email address. If you already have a NYTimes account (free or paid) associated with your CUNY email, you need to unlink your CUNY email from that account before signing up for your Academic Pass. Log in to NYTimes.com, click your Username in the top right corner, select “My Account,” and replace your CUNY address with a non-CUNY one. You can then use your CUNY address to register for your pass. At the bottom of the Welcome page, click “Continue.” You will be prompted to check your email. Watch for the confirmation message, which should arrive within 15 minutes. Click the link in the confirmation email. This will simultaneously verify your eligibility and grant your Academic Pass, which will provide access to NYTimes.com for 52 weeks. If you don’t get the confirmation email, check your spam filter. If you still do not receive it, send an email from your CUNY email account to edu@nytimes.com. Ongoing Use: Once you have activated your Academic Pass, you should have full access for 52 weeks (364 days) with no further action on your part. If you see a message that you are reaching the limit of free articles on the site, you’re probably not logged in. Simply log back in. Renewal: As people who have signed up reach their one-year anniversary, their passes will expire, and they will start seeing the article counter again. Then, after accessing 10 articles, they will be prompted to subscribe or log in. When this happens to you, just go to http://nytimes.com/passes and sign in as an existing subscriber to enjoy another free year of access to the digital New York Times. Apps: Your Academic Pass includes access to the NYTimes apps. Once you have registered your Academic Pass, you can access nytimes.com on most web-capable devices. Canceling a Personal Subscription: To cancel your personal subscription, call NYTimes customer service at 1-800-NYTIMES or, if you subscribed through iTunes, follow these instructions. There may be other things you have to do, depending on the device you have been using to read the NYTimes. If you had an annual subscription, you will receive a refund for the unused portion of the year. If you had a monthly subscription, you will not receive a refund for the month in which you cancel. Purchased with Student Technology Fees, the Library currently loans 20 Dell laptops to Lehman undergraduate and graduate students. Laptops are available for a three (3) hour loan within the Library. Laptops are circulated with chargers and carrying cases. All items are charged to the student's account. Please make certain to return all items. Purchased with Student Technology Fees, the Library has iPads and iPad Minis available for two-day loan. iPads have been preloaded with 30 apps. Students are not permitted to add additional apps. A number of Group Study Rooms are located on the third floor for use by Lehman students only. The rooms are kept locked. Keys can be obtained at the Reserve Desk. 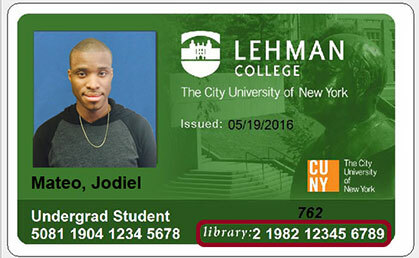 Students wishing to use the Rooms must have a current valid, barcoded Lehman ID. There is a three (3) hour limit on use of the Rooms at any one time. Fines will be charged for overstaying the time limit and for lost keys. Due to the size of the Rooms, only four students maximum are allowed at any time. Keys may not be renewed during Exam periods. Group Study Rooms have been upgraded to support collaborative group learning projects with Student Technology Fee funds. Study Rooms have been equipped with 42” LG LED monitors, control panels with two HDMI ports, VGA port, two data ports for Internet access, as well as easy access electrical outlets. All necessary cables will be provided at the Reserve Desk on the first floor. Usage Policy: Only current students, staff, or faculty can use the Bloomberg Professional terminals. Each user is limited to 90 minutes, and priority is given to students and faculty of the Economics & Business Department. Location & Reservation information: There is one Bloomberg Professional terminal in the Library. Instructions for use are available at the Reserve Desk or via the Bloomberg Research Guide. You must reserve a time slot below and then register at the Circulation Desk on the 1st Floor of the Library. The Library uses the Library of Congress Classification (LOC) to categorize books. Books are shelved near each other based on similar subjects. Browsing in an area improves your chances of finding related resources of interest. You may borrow books located in the second and third floor stacks. Reference books on the first floor are for Library use only. The Library maintains a collection of past Undergraduate and Graduate Lehman College Course Bulletins. We do not maintain any course syllabi. Course Bulletins are located at the Reference Desk, with duplicate copies available in Special Collections. Lehman alumni may visit the Library in person to access Bulletins and photocopy necessary information. Alumni must present photo ID to enter the Library. They must inform the Guard they will be using Course Bulletins at the Reference Desk. To guarantee entry, alumni are advised to call the Reference Desk (718-960-8580) in advance to request an entrance pass left with the Guard. Please use the Course Description Request Form. Phone requests will not be accepted.Course descriptions can be e-mailed to you as a PDF attachment - or they can be faxed or mailed. Only Lehman alumni - not educational institutions - are eligible for this service. For questions, please e-mail library.reference@lehman.cuny.edu or call the Reference unit, 718-960-7759. The Library's Lost and Found is centrally located at the first floor Circulation Desk. Lost material of value is transferred to Public Safety after one month. All other materials are kept until end of semester - then discarded.